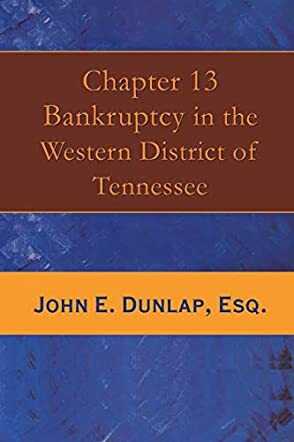 Chapter 13 Bankruptcy in the Western District of Tennessee is a legal resource book for the layperson, written by John E. Dunlap. While most consumers never envision having to file for bankruptcy, sometimes that option may be the best solution for their financial situation. In his guide, Dunlap, who has been a bankruptcy attorney in practice since 1989 and has taught continuing education courses on the subject, begins with a glossary of legal terms. He then discusses the differences between Chapter 7 and Chapter 13 bankruptcy, and he shows how deciding upon one or the other should depend upon one’s burden of unsecured debt and ownership of a house or a car that they wish to keep, among other things. He cites the time length of a Chapter 13 bankruptcy and its effect on taxes, mortgages, student loans and other expenses that should be considered, and he also discusses situations where a bankruptcy filing should be delayed. Dunlap stresses the need for listing all debts and assets, and he sets out the steps one should take in preparing for a Chapter 13 bankruptcy. Chapter 13 Bankruptcy in the Western District of Tennessee introduces the subject matter in language that is relatively free of legalese and designed for readers with little or no legal background. While the book is focused upon the Western District of Tennessee, it goes a long way toward helping consumers in any state decide if bankruptcy is the right option for them and, if so, whether to opt for Chapter 13 or Chapter 7. Dunlap goes into his subject in some depth, and he demystifies some rather frightening aspects of the proceeding, including the Meeting of Creditors. What he doesn’t do, which is a very good thing, is give the reader any sense that he should file on his own; rather, Dunlap gives the reader the necessary information to make a selection of bankruptcy type and lists the documents one should bring when having a consultation with an attorney. Chapter 13 Bankruptcy in the Western District of Tennessee is most highly recommended.